Panterials was created as the engraving world shifted towards computerized engraving. We represented the original H-Square Champion system (Meistergram). Now that the engraving industry has upgraded to laser engraving, our staff has up-to-date expertise with laser systems. Our firm is staffed by professionals who are dedicated to friendly service, quality, technical accuracy and competitive pricing. Special emphasis is given to multi-colored designs, close registration hot-stamped badges and high-volume fabrication processes. Rotary Engraving Materials, Laser Engraving Materials, Metal Engraving Stock, Engraving Cutters, Engraving Machinery, and Braille Balls. We're sure we can meet all of your needs. New for sign making and engraving, Rowmark® is excited to introduce the Granites DeluxeTM product line. The Granites Deluxe line has been designed to provide a cost effective solution for engravers and sign makers who currently use other solid surface materials for signage. Most solid surface materials used in sign making require a secondary paint filling operation. This extra process adds labor, lengthens delivery times, and often requires a clean up. Rowmark has solved this problem by producing a 2-ply product that can be engraved or routed in one step with no secondary operation required. Very few 2-ply products exist that offer this unique appearance and ease of use. 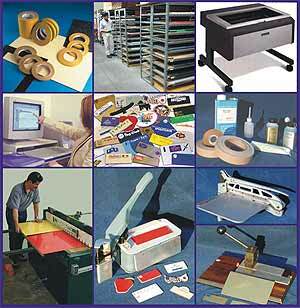 Panterials keeps a large inventory of Rowmark and other quality engraving materials. We stock only the finest materials available in today's market. We continually strive for continued growth and excellence in the engraving material and engraving machinery markets, and to be on the 'cutting edge' of the engraving industry. We are here to assist all engravers with our products and services. If you have questions about engraving, engraving supplies, engraving machinery or other engraving tools, please feel free to contact us by calling us toll-free at (800) 231-4644, or by sending us an e-mail at info@panterials.com. © 2003-2016 Panterials, Inc. All rights reserved. Federal copyright law prohibits unauthorized reproduction by any means and imposes fines up to $25,000 for violations.